Toss together pineapple, coleslaw mix and green onions; toss with coleslaw dressing until well coated. Refrigerate for at least 10 minutes. Mix together chicken, bread crumbs, egg, Worcestershire sauce, liquid smoke (if using), garlic powder, onion powder, salt and pepper. Divide into 4 portions; shape into 1/2-inch thick patties. Preheat grill to medium-high heat; grease grate well. Grill burgers for 4 to 5 minutes per side or until cooked through, brushing with barbecue sauce during the last 2 minutes of cooking. 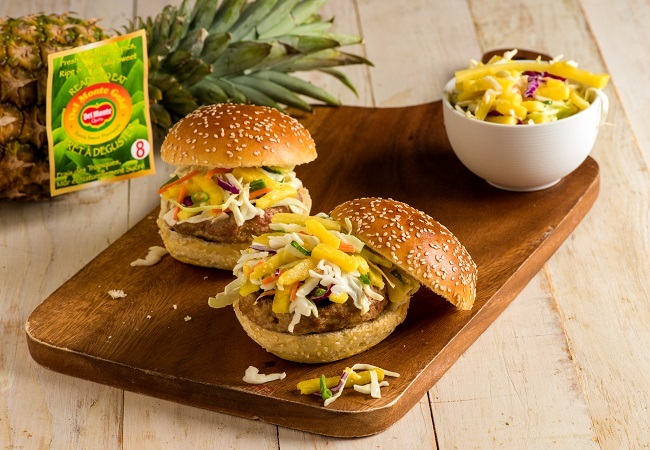 Serve burgers in buns with pineapple slaw and red onion slices (if using). Serve remaining pineapple slaw on the side. Leftover slaw can be covered and refrigerated for up to 2 days. Serve leftover slaw with pulled pork or grilled shrimp.